Since the primary election, I have been speaking to candidates, reading their positions as reported in local media and watching the debates. Of all the candidates, only Roxanne Murphy has not responded to my emails asking for a meeting. I have met with Clayton Petree on two occasions, once with Bob Burr and once with Pinky Vargas. As for Roxanne, I am flabbergasted that a candidate for an at-large position on the Bellingham City Council, which essentially represents all wards, would not even respond to a prospective constituent’s email. All I know about her is from some statements published in various media, and her performance during the League of Women Voters debate. 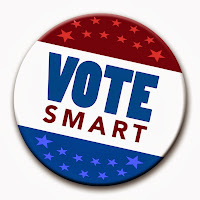 I am not a single issue voter, but some topics are of greater interest to me and I regard these subjects, to some extent, as bellwethers to gauge a candidate's thought processes and the use, or lack of, factual data. From what I have been able to determine, her opinion on rental health and safety has been muddled by an experience in Tacoma, a city with a badly flawed ordinance that is no more effective, and a lot more cumbersome, than what we currently have here in Bellingham. You can read my exchange with Riley Sweeney in the comment section of his blog entry on candidates by clicking here. When asked for a statement on issues for the Voters’ Pamphlet distributed by the Whatcom Couny Auditor, Roxanne wasted valuable space listing the people and organizations that have endorsed her. Endorsements are not ideas. Endorsements are not policy concepts. Endorsements are not positions on issues. Endorsements proffered by a candidate are nothing more than statements of obligations to groups or individuals. By contrast, Bob Burr is long time resident of Bellingham whose learning curve on the problems facing Bellingham is not an issue. This is a man who put himself on the (rail) line for a cause (anti-coal) and was arrested during that protest. He is still facing legal action. This alone should qualify him for a council seat! Bob is a progressive thinker who will bring a badly-needed fresh presence to the council. He takes no money and therefore creates no obligations. Having been here for almost two decades he is very well informed about rental safety and health, supporting the registration and inspection of all rental units through a revenue neutral fee system that will not affect the city's general fund one whit. Bob’s statement in the Voters’ Pamphlet is about ideas and approaches to problems. It is about specific stances on issues and not at all like Roxanne’s generalized statements about endorsements and believing in Bellingham, whatever that means. Pinky Vargas should have waited a few more years before running for City Council. She is lively and engaging but that is not the stuff of policy and speaks little to knowledge about issues. I enjoyed speaking with her and she listened intently. The problem is that running for office is about having knowledge and positions on issues before becoming a candidate. All candidates learn while seeking office, but running for office is not a process during which one begins to cobble together ideas for a coherent campaign. Her response to me on rental health and safety was tardy, as she evidently had no position when she began her campaign. When I did get a response, it was a mish-mash of incomplete and fuzzy thoughts that she had already provided in written form to the Bellingham Herald. You can read her comments by clicking here. It looks like a statement written by a committee. She mixes in talk of affordable housing. She "wonders" if we can have an inspection program without dipping into the general fund even though I told her that a $2 per month per unit fee would bring in over $400,000. The funding of registering and inspecting rentals would be revenue neutral. If $2 is not enough, make it $2.50. The fact that $1.5 million of our general fund goes to the museum department each year might be something for Pinky to examine, but I am not hearing anything about that. I have met and spoken with Clayton Petree before his candidacy and twice since he began his run for City Council. We certainly do not agree on everything, but Clayton has a command of facts about the issues facing Bellingham that far surpasses Pinky’s knowledge. Clayton can hit the ground running. My friend Pat McKee of the Sunnyland neighborhood recently wrote to his neighbors, “Clayton Petree is an independent thinker, with good analytical skills. Clayton's viewpoint and talent are needed on the City Council.” I agree. When I spoke to Clayton about rental licensing, he was not an enthusiastic proponent, however, after a long conversation he came back to me in an email saying he could support the concept of licensing and inspection of rentals. This is a candidate who listens and processes facts. I can work with that. I will not automatically support party favorites. I want some clear thinking and innovative voices on the City Council. Bob Burr and Clayton Petree are my picks to turn the council into an effective and forward-looking legislative body. The Sehome Neighborhood is hosting a community forum on Monday, 21 October at 6:30 pm (WECU Education Center) to discuss the recent riot, skills for keeping parties safe and greater accountability for health and safety in rentals. See the announcement here. You also may wish to read my article in NWCitizen on the recent riot and the implications with respect to the proposal to create a private dormitory for nearly 600 students in the Puget Neighborhood, called University Ridge. Click here to read that article. 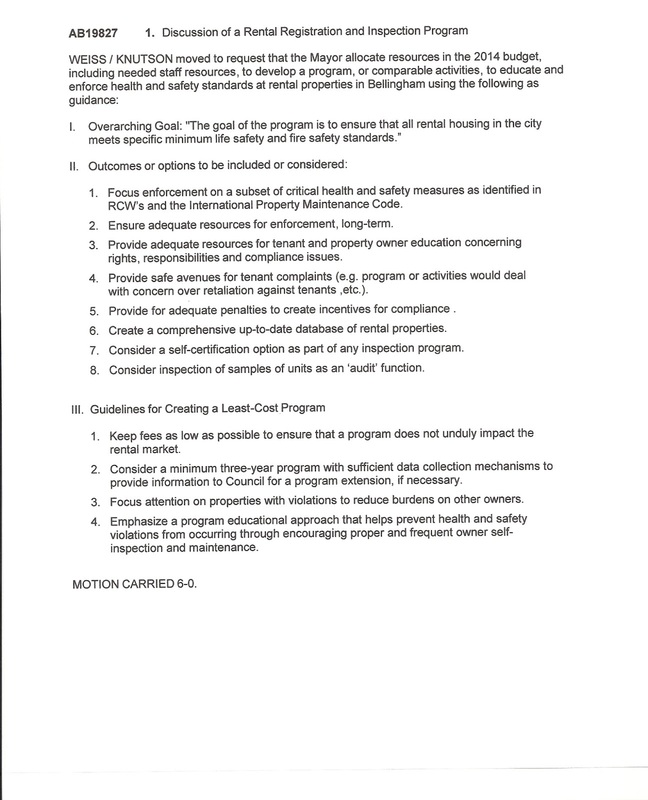 By a vote of 6-0 (with Council Member Fleetwood absent) the Bellingham City Council agreed on June 17th to place the issue of rental licensing and inspections for discussion at the 2014 budget priority planning session. Largely because the City Council failed to place rental health and safety as a budget priority at its planning session for 2013, the Mayor was able to claim that the city did not have funds to start up any new program during the 2013 fiscal year without identifying offset funds from another program. Fiscally speaking, the Mayor is correct. She has to work with the budget that the Council approves. That being said, safety and health is an urgent consideration and such issues should not be delayed. Click here to see the minutes of that council meeting. 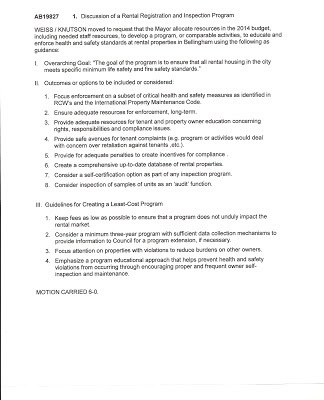 Above left you will find a copy of the motion that was passed asking the mayor to allocate resources to a health and safety program for rentals in the 2014 budget. I have argued previously to the council and the mayor that if we can afford $1.5 million per year to fund a museum department, we can find sufficient monies for start-up costs for a licensing and inspection program. After that, the program can easily be self-supporting from registration fees collected yearly from landlords. A mere $2 per month charge per rental unit, less than your simple latte at a downtown coffee shop, will bring in over $400,000 per year to run effective licensing and inspection of all of the city's 17,000 rental units. This will ensure long-term viability at an manifestly low cost. That being said, there are several aspects of the council's proposal that I find troubling. Under section II "Outcomes or options to be included or considered" is (number 7) "Consider a self-certification option as part of any inspection program". This option sounds reasonable until examined more closely. Such an option would require that a landlord sign and submit a certification that his/her rental units are in acceptable condition given a list of areas to be inspected, such as the electrical system, structural integrity, etc. I am not a landlord but even I would be very hesitant about signing such a document unless I had the advice of an expert who has already examined the rental unit. To do otherwise is to invite disaster in the way of a lawsuit should an accident happen in an area declared (by oneself as landlord) acceptable. No landlord, unless he/she happens to be a certified home inspector, has the knowledge to self-certify. So this "option" of self-certification effectively forces landlords to have their units inspected by a professional - and at their own expense. This defeats the purpose of an inspection program run by city inspectors which is provided for all landlords who pay low and reasonable fees to a common program. Another problem with relying primarily on private inspectors for periodic inspections is that the city neither gains nor retains any institutional knowledge of the city’s rental units. Paper reports from private inspectors are no substitute for the experience of a city inspector whose employment is, for all intents and purposes, long term. The Mayor and the Planning Director will have no group of in-house code enforcement officers to whom they can go for experiential knowledge. The use of private inspectors is allowed under law. In fact, this was one of the challenges to the Pasco licensing ordinance, that city inspectors would be the sole inspectors. The landlords there wanted the option to hire their own. They have that option now and is written into the state law passed a few years ago. I am not sure how that serves the landlords since, as I mentioned above, a properly structured program with a revenue neutral fee system (the program fees will pay for the program) will spread the cost of inspections over all landlords and result in much lower per inspection costs. The Mayor and the city council are underestimating the capability of a small team of city inspectors over time. Again, I bring up Pasco, a a city that has the institutional experience of these inspections that are based on an inspection checklist easily adoptable without re-inventing the wheel. We should also explore their cost data and performance data regarding the time necessary for an inspection of a unit. The Code Inspector in Pasco told me that one inspector could do 8-10 inspections per day. Reliance primarily on private inspectors for the verification of our rental units is a de facto privatization of an inherently governmental function, that of health and safety. (Fire departments were once a private sector function and we know how that worked out.) Such a reliance invites collusion between the inspector and the inspected while depriving all landlords of a well supervised and even-handed inspection regime whose inspectors are accountable as city employees. I have made these concerns available in an email to the Mayor who had expressed to me her desire to have an licensing ordinance that relies primarily on private, certified inspectors. She has not, as yet, responded to my comments. Item 8 Under section II "Outcomes or options to be included or considered" also gives me pause. It reads "Consider inspection of sample units as an 'audit' function". Although this may sound reasonable, this should not be an option at the outset of any safety and health program. An audit option may be adequate after an inspection program of all units has been operating for some time, however, Bellingham's rental stock HAS NEVER BEEN INSPECTED. This means that the likelihood of violations in thousands of units is very high. In fact, the two surveys run by Western Washington Students have demonstrated that very situation. (See these reports here and here). Audits will not do the job up front. 1. Keep fees as low as possible to ensure that a program does not unduly impact the rental market. The fee, although not having been set yet, has widely been spoken about as being about $2 per month per rental unit. This cannot, in any sense, be construed as being "unduly" impactful. Even a $3 per month/unit fee is not going to break the bank. So to what does this "guideline" refer? The intent is unclear. There are already impacts on the rental market every year as landlords raise their rates if for no reason other than they can do so. After all, the market here is tight (low vacancy) and renters have little bargaining margin, if any at all. [Perhaps the city council might want to take up that issue at a later date.] Absent a declaration from the council, one might imagine this guideline would have to do with the cost of repairs to units in order for them to be habitable. The rental industry has placed fear in the hearts of some council members that these inspections might occasion prohibitively expensive repairs in order for the units to be safe and healthy. An odd position in that landlords already claim that there are only a few bad apples. Also odd in that nobody is claiming that the council wants to use the International Building Code book in its entirety to seek out unconforming bannister or window heights and mandate expensive remodeling. Council Planning Committee head, Jack Weiss, has stated this during several work sessions of the committee. 2. Consider a minimum three-year program with sufficient data collection mechanisms to provide information to Council for a program extension, if necessary. There is no reason to take the time and effort to register and license rental properties for a three-year program that has to be re-authorized by a future council - even if it proves successful. If we are to establish a rental health and safety program it should be permanent since rentals come and go as landlords come and go. Constant surveillance is necessary. The health department does not inspect a restaurant kitchen once and then abandon all further efforts to ensure the owner adheres to regulations. In my conversations with the rental code enforcement officer in Pasco, he indicated that after the initial inspection of all the city's rental units, the inspector returned to previously inspected units after 2 years and found that some units had already begun to deteriorate. 3. Focus attention on properties with violations to reduce burdens on other owners. This guideline is totally inexplicable as I have said time and again in this blog. Nobody has ever satisfactorily articulated how this methodology will play out. The presumption is that the "bad apple" landlords will somehow be "outed" and that then the city can then "focus attention" on them. With thousands of single family home rentals and small apartment buildings, there is no mechanism I can imagine that will magically expose the bad ones except an inspection of each unit. Anything else relies on spot checks (that will miss dangerous units), complaint driven programs (the city's current ineffective ordinance) or self-certification (a poor method as I explained above). And just what are these "burdens" that will be place on the "other owners"? That once every three years at the most they must open their units for inspection to ensure the health and safety of the tenants? That they may have to actually spend money on repairs to protect those who are paying them money to live in a rental unit? That they have to renew a license each year? 4. Emphasize a program educational approach that helps prevent health and safety violations from occurring through encouraging proper and frequent owner self-inspection and maintenance. The emphasis ought to be on an inspection program that is supplemented by an educational element. The difficulty with any such education program, a poor substitute for code enforcement entering the property, is reaching the target audience. The landlords can be contacted through their professional organizations such as the Whatcom Realtors or the Northwest Rental Owners Association. There are no such groups available to reach tenants who are a very diverse population. Student renters can be reached through the various educational institutions and through student government bodies but even this presents a challenge in that every 3-4 years there is an entirely new cohort of thousands of young student renters as they pass through the university/college system. There is still much in the way of discussion to be had on an effective program to license and inspect our rentals for the health and safety of the tenants. This discussion should be an active part of the coming elections for city council. Everyone who’s rented property in Bellingham, Wash. for more than a year probably knows at least two people who have had problems with their rental company. Whether insects, leakage or the ever-present black mold that is the scourge of our moist seaside climate, renting in Bellingham can be a nightmare if tenants are forced to deal with unresponsive rental companies. Never mind the unsightly or unhygienic elements in living in such conditions; the health risks associated with black mold inhalation can be serious, even life-threatening. It’s easy to understand a business’ reluctance to rent to college students. Images of wild parties, cigarette-burned carpets and gaping holes punched through drywall must dance through a landlord’s head every time pen touches lease agreement. The large college population in Bellingham leaves them little choice in tenants, too. However, ensuring that a property is up to code is not optional, and certainly in a landlord’s best interest. The lawsuits that can result from shoddy maintenance can be worth much more than mere cosmetic damage. Having cleaner, safer apartments is in everyone’s best interest. People will be more inclined to treat their apartments with respect if it’s respectable to begin with. There is not a lot of initiative for either landlord or tenant to maintain a disgusting apartment, any more than someone would feel the need to repaint a car in a junkyard. Just because students typically rent lower priced units doesn’t mean our health and well being are any less important. The editorial board is comprised of Editor- in-Chief Steve Guntli and Managing Editor Shannen Kuest. This is not the first Western Front editorial on the squalor that students meet yearly in their quest for housing. The Editorial Board speaks to the students regularly from the pages of the Front. You can read prior editorials by clicking on each of the years: 2010, 2011, 2012. Perhaps a 2014 editorial may announce the passage of a rental health and safety ordinance. With a city council election this fall that will see new council members replacing Stan Snapp and Seth Fleetwood, who have consistently opposed attempts to clean up Bellingham’s rentals, the students and all other renters may finally get the legislation they deserve.